Lloyd P. George was sustained as a member of the First Quorum of the Seventy on October 1988. He was released in October 1994. 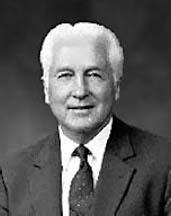 He also served in the Church as a bishop, stake president, regional representative and as president of the Arizona Tempe Mission. He also served as a missionary to the Piute Indians on the Kanosh Indian Reservation. George was born on September 17, 1920, in Kanosh, Utah. He and his wife, Leola, were the parents of three children. His education at Brigham Young University was discontinued due to the outbreak of World War II and he enlisted in the US Air Force. During his career, he had a grocery business, a mercantile business, and a cattle enterprise. later he was a real estate broker. George died on May 13, 1996. “I stammered and stuttered terribly in my youth,” he said. “Up until the time I went on my mission I had never given a talk. I couldn’t participate when called upon in school. People would ask my name, and I couldn’t answer. His parents, Preal and Artimissia, sent him to speech teachers and therapists, but they couldn’t help him. Then, when he was eleven years old, he was given a patriarchal blessing in the hope that it would provide him encouragement. After a month of being unable to communicate with those he visited, he prayed, “Lord, it’s now or never. Help me now, or I go back home.” Then he fasted. His speech began to improve. “We had been holding weekly cottage meetings with five elderly women,” Elder George said. “At the next meeting I was able to speak fairly well. Afterward my companion said, ‘What happened to you tonight? Ordinarily I couldn’t turn you on, and tonight I couldn’t turn you off.’ . . . This page was last edited on 29 March 2017, at 22:44.